If you appreciate having a large countertop microwave that can hold large casseroles and make cooking dinner easy, then you’ll probably find the GE JES2051DNBB a perfect fit. 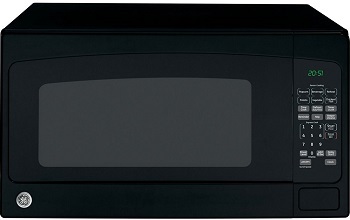 This 2.0-cubic-foot microwave has an array of convenient features designed to take the hassle and guesswork out of heating or defrosting dishes. For instance, we liked the auto defrost option, which calculates the appropriate power level and time for defrosting something based on the weight you enter. This model is designed to look attractive, sleek, and modern, with a glossy finish that unfortunately tends to pick up fingerprints easily. However, the inside doesn’t need to be cleaned often because food “explosions” don’t happen often. Of course, the obvious downside of a microwave with such great capacity is that it has a large footprint on your counter, so be aware of how much space you are willing to sacrifice for this model, available for $169.